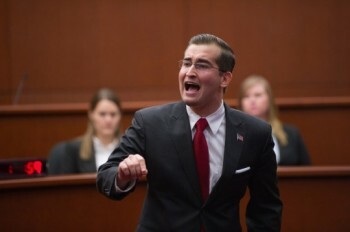 The Syracuse University College of Law Moot Court Honor Society will host the final round of the 35th Annual Lionel O. Grossman Trial Competition on Thursday, Oct. 18 in Syracuse at James M. Hanley Federal Building in the ceremonial courtroom at 5:30 p.m. This year’s final round competitors include law students Elizabeth Molino and Ivan Pavlenko as plaintiff vs. E. Pete Frick and Olivia Zaiya as defense. Armani stands as a role model for legal ethics and is widely regarded as a hero within the legal profession. In 1973, he made an immeasurable personal sacrifice during his representation of Robert Garrow, the defendant in the Lake Pleasant Murder case in Lake Pleasant, N.Y. He has received numerous awards, including a Distinguished Lawyer award from the Onondaga County Bar Association in 2006 and, more recently, a nomination for the Michael Franck Award presented by the ABA Center for Professional Responsibility. Armani will serve as an evaluator during the final round, and he will present the third annual Advocacy award. Hon. Glenn T. Suddaby L’85, United States District Judge for the Northern District of New York, will once again serve as the presiding judge. In addition, the evaluating judges will include Armani, William J. Fitzpatrick L’76; Michael A. Bottar L’03, Anthony S. Bottar, Hon. John C. Cherundolo L’73, Hon. Thérèse Wiley Dancks L’91, Professor Emeritus Travis H.D. Lewin, Hon. David E. Peebles L’75 and Hon. Frederick J. Scullin Jr. L’63. The competition is named after alumnus Lionel O. Grossman L’16 whose son, Richard Grossman L’55, will serve as an evaluating judge this year. With the help of Lewin, this year’s competition involves a complete trial based on a thought-provoking civil fact pattern. The competition involves both second and third-year students and is designed to test their skills in evidence, courtroom etiquette and knowledge of trial practice.